A working mother who witnesses her boss harassing a co-worker must face the truth and take realistic action. Since this defining moment could affect her livelihood, taking action requires making tough choices. The woman’s courage holds the capacity to change the situation, to right a wrong and to model courage. If you want to stand out as a leader of your own life, you need to let your true self shine. We’re not talking about the big ego or the political moves we often see as someone maneuvers to get ahead. We’re talking about the authentic you that shows up and contributes to your fullest extent. People at work witness what we stand for, and straight (unambiguous) talk gets attention because it is uncomfortable for most people. Speaking with courage means learning to speak with your own voice, to express the truth that flows from your own “heart and spirit”—the opposite of fear of ridicule, dismissal and being ostracized. Candor is a cousin to courage. * It is only by learning to express ourselves from our own courageous identities can we begin to employ the courage action skill called “showcase your talents” that moves us beyond invisibility (the courage obstacle). One of the best tips to enhance your talent showcase is to think of two to three key emotional behaviors you want not only to convey but to demonstrate to peers, clients, bosses or interviewers (e.g., courage, accountability, passion, promises, etc.). Once you know their sentiments, you can weave the appropriate messages throughout your presentation, interview meeting and language. Use a variety of words, phrases and stories all geared towards evoking a positive emotional connection to the Brand Called You. You may not get the project, job or desired action, but you will overcome the invisibility obstacle. And you will be demonstrating your courage straightforwardness! Career-defining moments represent crucial points along your career path, places where you contemplate the virtues that compose your character and choose to step up to the next rung on the ladder or, lacking sufficient courage, slip back down. Every obstacle you face at work represents a potential career-defining moment. By simply recognizing these workplace obstacles as defining moments (things like failing to get an overdue promotion, or enduring verbal intimidation) you begin to rely on your personal, courage-based assets. Unfortunately, it has been noted by gender experts that many women have a tendency to miss the opportunities inherent in workplace obstacles and their responses reflect an underlying sense of self-defeat. They may perceive these potentially defining moments as just “part of the job,” or they may feel that in some way they deserve unfair treatment. They take on the role of martyr or victim in order to “keep the peace” or maintain the status quo, further stifling their true heart-and-spirit Self. Regardless of gender, frequently questioning your status quo moves you from the dominant “mind-will” to heartfelt will. Heartfelt will expresses itself when you give yourself permission to claim your courage. Staying stuck in the status quo provides a sense of safety for the ego but seeks to eliminate mystery and the creative discovery it engenders. More importantly, status quo fosters denial by silencing courageous ideas and stymieing courage behaviors. On the opposite side of the coin, the energetic action generated by courage creates a different type of safety. How? When the corporate ethic honors everyone’s “courageous intent,” truth prevails. An environment that displays this level of Spiritual Intelligence busts the status quo right out of the psyche. Physicist Danah Zohar’s research defines courage as one of the levels of Spiritual Intelligence (SQ) or wisdom. She writes in SQ, Spiritual Intelligence, the Ultimate Intelligence, “To have high SQ is to be able to use the spiritual to bring greater context and meaning to living a richer and more meaningful life, to achieve a sense of personal wholeness, purpose and direction.” Ironically, in order to step up the leadership ladder to advance your career, you must delve deeper into your spiritual Self to find a solid foundation that supports living a courageous life. The real challenge is to face and act on the insights that only such self-realization will bring. There is no “one size fits all” formula or courage pill for overcoming obstacles at work. The size and importance of obstacles change as does our capacity to deal with them. Only by journeying inward can we each identify the appropriate courage action that will advance our lives and careers beyond the obstacles we face at any given moment. True courage opens the door to spiritual awareness, and in welcoming spiritual awareness, you learn to refine your talents so they become more clearly visible revealing your Spiritual Intelligence (SQ). 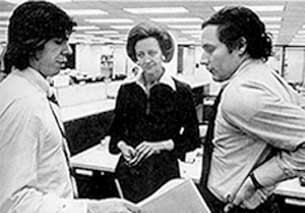 CEO Katherine Graham and her team at the Washington Post stood behind the decision to publish the Pentagon Papers, even while the Nixon administration made threats and the company’s stock dropped. Revealing the values in which she believed most strongly, Katherine displayed a courageous combination of integrity and high standards. The merit of Katherine’s resolute spiritual courage was reflected in her refusal to play it safe, dodge discomfort or hedge her bets—all examples of Spiritual Intelligence (SQ). Holding herself accountable for her decisions, she endured the temporary discomfort of outside pressures and the potential for failure. When was the last time you failed? Did you use that failure as a gain? Sandra Ford Walston is known as The Courage Expert and innovator of StuckThinking™. She is an organizational effectiveness consultant, speaker, trainer and courage coach. This entry was posted in change, HR, Innovation, Leadership Skills and tagged authenticity, brand called You, business women, candor, career path, career-defining momen, corporate ethic, courage, courage behaviors, courageous life, defining moments, denial, ego, ethics, failure, heartfelt, ideas, innovation, integrity, invisibility, Katherine Graham, leadership character, Nixon administration, Pentagon Papers, performance brand, personal brand, promotions, purpose, ridicule, self-realization, spiritual awareness, Spiritual Intelligence, status quo, straight talk, stuck, success, talent, truth, verbal intimidation, Washington Post, wisdom, workplace obstacles. Bookmark the permalink.